This photo is of an unknown cricket team. The only person in this photo I know is my Dad who is on the far right in the umpires smock. I dont know when it was taken or where. It is possible it was taken on Berry Hill Park but it am not sure. 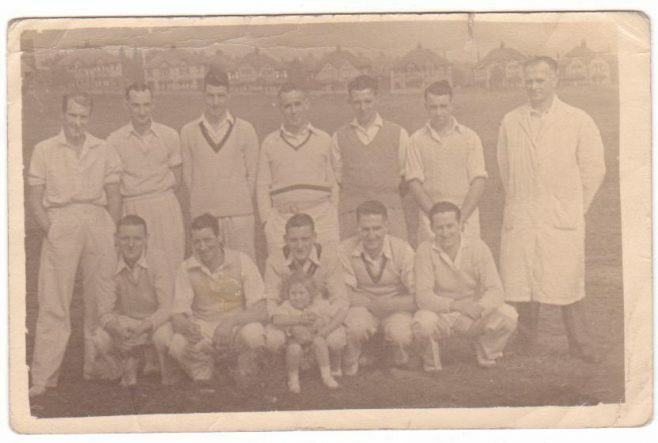 My father Ken Clifford worked at Pye’s from th end of the war to retirement and I don’t recall there ever having been any mention of a cricket team. Peter….The photograph is definitely not Landers in the 1950’s. I used to play for them then…Brian may well be right in saying it could be Mansfield Post Office team..I do recognize some of the team, so I could have played against them. Could this be a Landers Cricket team, late 50s early 60s? With the style of the houses in the back ground, it looks quite like the bottom of Berry Hill road where the spider park is, except that its in reverse, I wonder if the photogragh has been developed back to front.